Animal Medical Center of Jefferson City is a state-of-the-art medical center that strives to consistently provide your pet with the best possible medical service in a caring atmosphere. Animal Medical Center of Jefferson City is a full-service hospital that offers diagnostic services, an in-house laboratory, radiology (X-rays) and surgical facilities, all of which allows us to provide your pet with quality healing and preventive care. 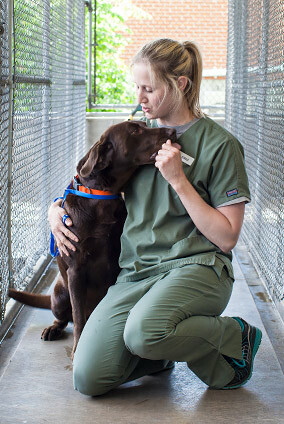 If your pet becomes sick or injured, we have the resources to provide them with the care they need. The hospital's internal medicine, diagnostic and surgical capabilities—supported by a network of sophisticated referral hospitals—means that we work quickly to get you an accurate diagnosis and treatment recommendations while minimizing both your pet's discomfort and your worry. When you bring your pet in to see us, we want you to feel confident your pet is receiving the best care possible. Ask us anything you want to know. The veterinarians and staff at Animal medical Center of Jefferson City know that great veterinary care begins with taking the time to get to know your pet, talking with you and giving you all of the information you need to make the right decisions for your dog or cat*. * Please note that Animal Medical Center of Jefferson City does not treat primates or venomous animals. Thank you for your understanding. Animal Medical Center of Jefferson City is among 12-15 percent of animal care facilities in the nation certified by the American Animal Hospital Association (AAHA), the world's leading association of companion animal practitioners. The recognition we've earned from the AAHA means that when you bring your furry friend to the hospital, they will be cared for with the highest standards veterinary medicine has to offer. 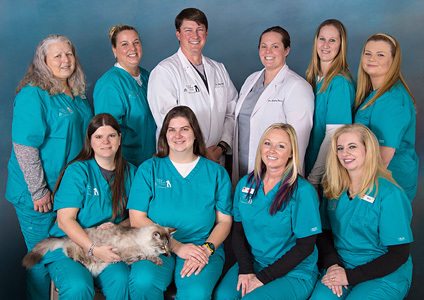 The veterinarians at Animal Medical Center of Jefferson City are accredited by the American Association of Feline Practitioners, American Veterinary Medical Association, Missouri Veterinary Medical Association and the East Central Missouri Veterinary Medical Association. At Animal Medical Center of Jefferson City, we have a long history of providing high-quality veterinary services for your animal family members. Founded in 1952 by Dr. Ernest E. Burgess and operated out of his home, Burgess Veterinary Hospital began by providing the local community with excellent pet care services. Years later, the hospital was renamed Howard Veterinary Hospital when Dr. James P. Howard purchased the practice in 1984 upon Dr. Burgess’s retirement. In 2009, Dr. Greg Boyer purchased the practice and renamed the hospital Animal Medical Center of Jefferson City, continuing the hospital’s work of providing excellent veterinary care in a caring atmosphere. While the hospital has undergone many changes over 60-plus years of service, the hospital’s commitment to provide quality care for family pets has remained constant. Please take some time to learn about the services we provide and about why you can trust us with your pet's health, now and for years to come. If you have any questions or would like to schedule an appointment, please email or call (573) 636-4626. We look forward to meeting you and your pet. Animal Medical Center of Jefferson City works closely with Friends of the Jefferson City Animal Shelter, the Heart of Missouri Humane Society, Callaway Hills Shelter and the STARS program. We are a proud sponsor of the Jefferson City Pet Parade, the Ducks Unlimited Auction and the March of Dimes Walk. Mon – Fri: 7:30 a.m. – 5:30 p.m.
We off monthly cat-friendly hours. Please call for times. Animal Medical Center of Jefferson City accepts payment in the form of cash, Discover, MasterCard, Visa, and personal checks with a valid driver's license. Payment is due upon completion of services. If you have any further questions or would like to schedule an appointment, please give us a call at (573) 636-4626. We look forward to meeting you and your furry (or not-so-furry) friend!